Grand Cru Brand rises as a steep amphitheater above Turckheim. This hot pot rests on relatively easily weathered granite bedrock with very good drainage. Therefore Brand excels during cool years with a long autumn. Riesling wine from Brand are floral and has an elegance that brings to mind Muscat, while Muscat instead have profound depth and can withstand long storage. 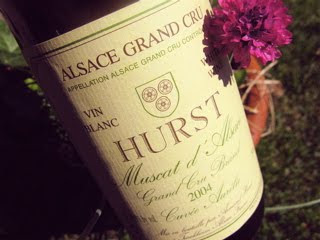 2004 Muscat Grand Cru Brand Cuvée Aurélie has a developed, creamy aroma with mint, roasted almonds and honey, which brings to mind sweet half sibling such as Moscatel de Setúbal and Muscat Beaumes-de-Venice. The taste is totally dry but juicy with superb minerality in the aftertaste. A wine loaded with power but only a little alcohol - to a ridiculous price! Price: € 9.50.